MOORHEAD, Minn. – Turnovers proved to be the difference in a 27-17 loss for the Gustavus football team at No. 16 Concordia-Moorhead on Saturday. The Gusties led 14-10 at halftime, but the Cobbers were able to turn an interception and a fumble recovery into 14 points, while holding the visitors to a field goal in the final 30 minutes to secure the victory. Gustavus drops to 3-2 overall and 2-1 in the Minnesota Intercollegiate Athletic Conference, while Concordia remains unbeaten at 4-0 overall and 2-0 in the league. Concordia outgained the Gusties 305-226 in yards from scrimmage, relying heavily on its ground game for 274 rushing yards. Gustavus posted a season-low 183 passing yards along with 43 rushing yards. On the first play of the game, the Gusties were supplied a jolt of momentum as Austin Fest (Fy., West Des Moines, Iowa) forced a fumble on the opening kickoff return, which was recovered by Matthew Montplaisir (So., Buffalo, Minn.). The Gustavus offense took the field on the Cobber 27-yard line and the initial drive sputtered out and was forced to punt, but a personal foul gave the Black and Gold a fresh set of downs. Two plays later Michael Veldman (Jr., Becker, Minn.) found Hunter Johnson (Sr., Cannon Falls, Minn.) for a 26-yard touchdown – their third scoring connection of the season. Both teams’ next possession ended with a punt, but the Cobbers followed with an eight-play scoring drive, finishing on a 12-yard touchdown run and the score read 7-7 with 5:13 left in the first quarter. Gustavus took little time to answer as it drove 84 yards in eight plays, capped by a 36-yard touchdown pass from Veldman to Brice Panning (So., Hamburg, Minn.) and the Gusties led 14-7 with 1:59 remaining in the opening frame. Each team ensued with three punts apiece before Concordia was able to generate an offensive drive late in the half. The Cobbers went 38 yards on nine plays, resulting in a 29-yard field goal to make the score 14-10, which stood at halftime. The two squads traded short possessions to start the second half and Gustavus started its second drive of the third quarter from its own 25. Veldman nearly completed a 40-yard strike to Josh Kirk (So., Garvin, Minn.), but the pass fell incomplete. The following play, Veldman was intercepted and the Cobbers took it to the endzone for a 32-yard return and a 17-14 lead with 8:31 on the clock. Two possessions later, first-year quarterback Gavyn Walsh (Fy., Andover, Minn.) entered the game for an injured Veldman and guided the Gusties into Cobber territory, setting up a 44-yard field goal by Brendan Boche (Sr., Lakeville, Minn.) to tie the game 17-17 early in the fourth quarter. Concordia answered on the next drive, going 30 yards on six plays, capped by a 32-yard field goal to regain the lead 20-17 with 10:12 remaining in the game. The back-breaker for the Gusties came next as they fumbled the kickoff return, which was recovered by the Cobbers at the 23-yard line. Four plays later, the home team found the endzone on a four-yard rush and took a 27-17 advantage with 8:39 to play. The Gusties wouldn’t go quietly, though, as Drew Fredericksen (Sr., Forsyth, Ill.) returned the ensuing kickoff 79 yards down to the Cobber 15-yard line, but a quick three-and-out followed by a missed 25-yard field goal kept the score at a 10-point difference. Gustavus forced a Concordia punt on the next drive, but was unable to generate any more offense and time ran out on a potential comeback bid. Veldman finished the game 16-of-31 for 163 yards with two touchdowns and an interception in just over two quarters of play. Walsh came in and completed 5-of-8 passes for 20 yards. Karim Ortiz (Sr., Cancun, Mexico) was the leading rusher with 55 yards on 19 carries, while Johnson was the top receiving target by hauling in seven catches for 54 yards and a score. Matt Berkner (Jr., Sleepy Eye, Minn.) paced the defense with a career-high 14 total tackles. The Gustie defense was stout on third down, limiting the Cobbers to one first down in 10 attempts. 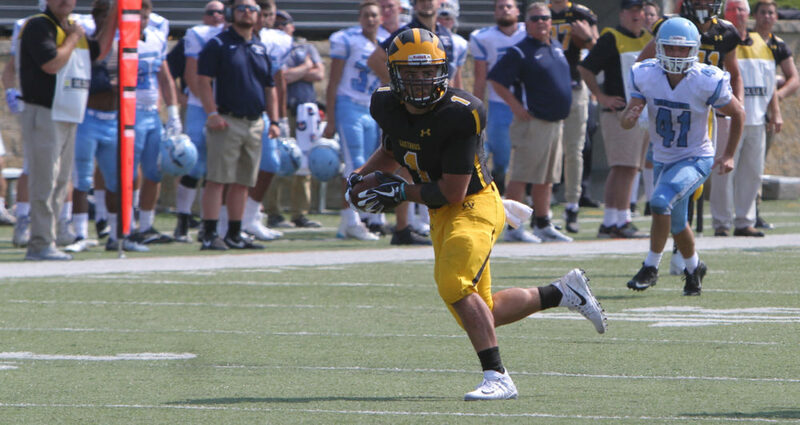 Gustavus now enjoys its bye week and is back home Oct. 14 against Bethel.